We focused our attention in the material composition ratio. With the natural repulsive force of the material and the water grabbing ability brought on by our special surface treatment, this worm was designed to appropriately maneuver at different water pressures (depth). Anglers will be able to appeal to basses in various feeding conditions. You can utilize JH to trace the mid-range, the surface range without a sinker, capitalizing on its falling or rig up a drop-shot rig. 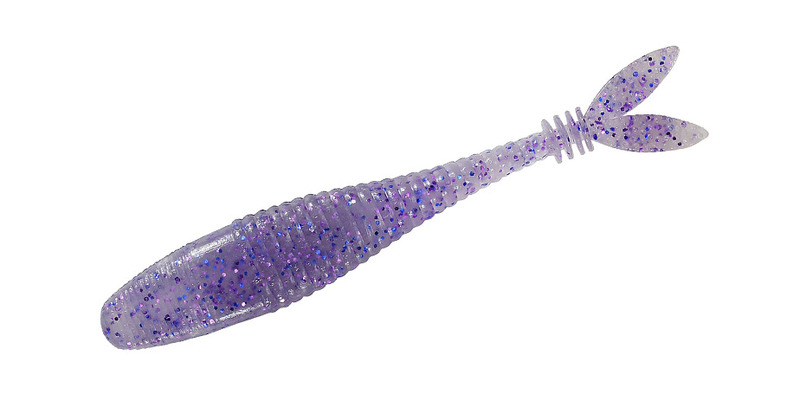 It is the next generation 3 inch shad worm able to work in various field conditions and fishing techniques. With its sense of vitality, the bass cannot resist. 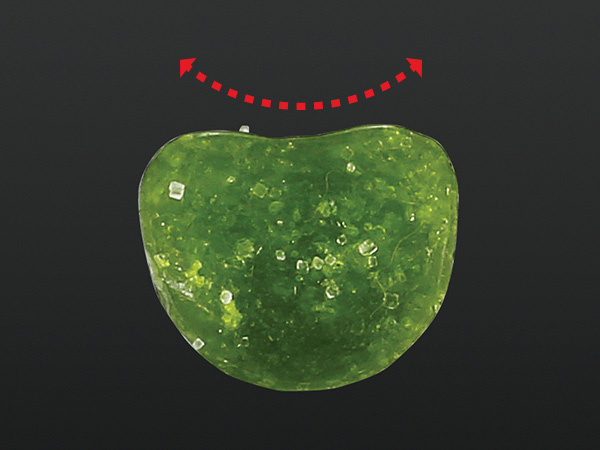 Our first soft bait in the Realis brand was developed with primary focus on finding the most suited material. Our ultimate goal was “Vitality”. It goes without saying that this soft bait will effectively perform the basic action of surface shaking and the mid-range strolling, but can also enact the subtle natural movement in the tail at the moment it hits the bottom in the deep zone. During the 2 year developmental period, not only did this soft bait go through countless field tests, but we also had to carefully select the soft material, various types of salt and size of grain and try out various formulations to find the ultimate ratio. The shape and material was finally decided from the enormous amount of test samples with extensive data regarding its water pressure and repulsive coefficient. This soft plastic will replicate a lively bait in various conditions, enticing a bass to use its mouth without hesitation. The R&D team developed the V-tail’s ballast system by selecting several types of sodium chloride (salt). It is known bass detect salt through their many taste receptors (skin and mouth). The V-tail’s salt content has specific density and leeching ratios. Through testing various salts were impregnated into the lure cavity without distortion. Even the selection of soft material used for the body’s profile needed to possess the ability to reduce underwater drag co-efficiency during propulsion. DUO’s carefully created unique, pliable profile with a quiver, dart action that would eliminate the bass’ hesitation to eat the lure. 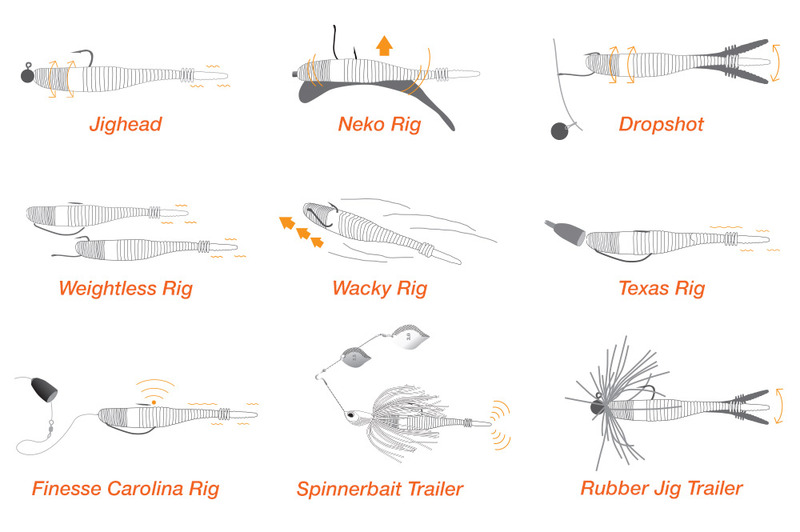 DUO continues to maintain its commitment to lure categories that preserve its quality and function as seen in its prior lure development. The large concave design in the back section will not only control the rising and sliding of the bait during shaking, but also efficiently transfer a realistic pulsation towards the tail section.